(PLAYA CONCHAL, Costa Rica) – Reserva Conchal – the gated resort community in picturesque Guanacaste – will host the Wine World Festival Sobre las Olas on May 19. The family-friendly event, which begins at noon, will occur at the community’s private beach club. Guests will enjoy world-renowned wines from around the world (with the opportunity to buy at the winery prices), outdoor cuisines from the best chefs in the Guanacaste region, gin and tonic mixology and wine tasting, and a live concert at sunset. Tickets cost $35 and can be purchased online. Set within Reserva Conchal’s vast 2,300 acres is the all-inclusive Westin Golf Resort & Spa, featuring a 60,000-square-foot private Beach Club. Highlights of the resort include an extensive swimming pavilion, modern workout facilities, fine dining, an exquisite spa and a Robert Trent Jones II-designed championship golf course. Later this year, the W Costa Rica, Reserva Conchal will open and place this part of Costa Rica among the elite in world-class destinations. The W will offer 151 guestrooms, and contemporary luxury touches and amenities such as a W Living Room lifestyle lounge, specialty restaurants, meeting space, a destination bar and lounge, an infinity edge pool and spa. Residents of Reserva Conchal can be as busy or carefree as they desire – and this “Pura Vida” lifestyle that embodies Costa Rica also characterizes the community. Property owners have access to Reserva Conchal’s Beach Club facilities – pool, gym, restaurants and spa. In addition to the Wine World Festival Sobre las Olas, weekly social events occur at the Beach Club, and nearby activities for the entire family include hiking the numerous trails found inside the community, partaking in many events and happenings at the resort, or enjoying the nearby white-sand beaches and tranquil waters of the Pacific Ocean. Perched on the edge of Costa Rica’s northern Pacific Coast on the brilliant white sands of Playa Conchal, Reserva Conchal Beach Resort Golf & Spa is the jewel of the Guanacaste region. Spanning 2,300 acres, it is home to the all-inclusive Westin Golf Resort & Spa Play Conchal, luxurious vacation residences and Costa Rica’s most renown golf course designed by Robert Trent Jones II. Property owners enjoy access to the 60,000 square-foot Reserva Conchal Beach Club featuring an extensive swimming pavilion, modern workout facilities, fine dining and world-class spa. The all-inclusive Westin Golf Resort and Spa, Playa Conchal sits on a pristine stretch of white sand and provides the ultimate in elegance – with personal concierge services at the Royal Beach Club and sumptuous amenities standard of the Westin brand. Additional five-star touches found at the resort include 10 on-site restaurants and bars, an award-winning golf course designed by Robert Trent Jones II, and a well-appointed spa that offers an array of services and treatments. (PLAYA CONCHAL, Costa Rica) – Reserva Conchal Beach Resort, Golf & Spa – the luxury resort on Costa Rica’s scenic northwestern Pacific coast – will host the PGA TOUR Latinoamerica Essential Costa Rica Classic May 1-7 on its Robert Trent Jones II golf course. The inaugural tournament – sponsored by the Costa Rica Tourism Institute – is the first-ever PGA TOUR event in Costa Rica. 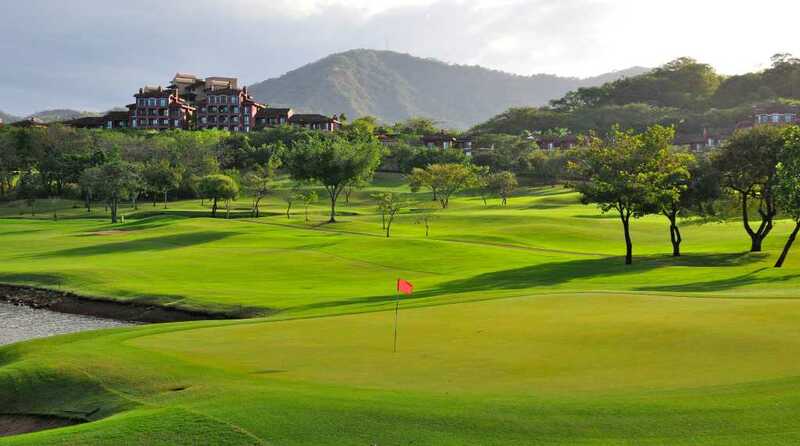 The Essential Costa Rica Classic boasts 144 professional golfers from more than 25 countries. Customary for PGA TOUR Latinoamerica events, the host country can invite up to 30 of its own golfers. The sporty, par-71 will be set up to play at 7,021 yards, its longest configuration from the back tees. Jones II’s brilliant routing meanders between the azure Pacific Ocean waters and lush greens of the neighboring “dry” tropical forest, exposing players to myriad elements. The returning nines feature breathtaking ocean vistas with unforgettable holes winding through lakes, rugged ravines and rolling hills. Consistently ranked among the top-30 best in the Caribbean and Mexico, Reserva Conchal was the first course in Costa Rica bestowed certification by Audubon International. It boasts a world-class practice facility and learning center with four green complexes, bunkers, chipping and approach areas and an expansive practice tee. Single- and multi-day golf clinics are offered, including the PGA TOUR Academy featuring certified instructors from famed TPC Sawgrass. Golfers have access to a wide spectrum of premium vacation residences at Reserva Conchal, with a variety of floorplans, bedrooms, amenities and settings. The luxurious, all-inclusive Westin Golf Resort & Spa Playa Conchal is nestled along a pristine stretch of white sand beach. The ultimate in elegance, the Westin features numerous restaurants, pools, fitness center and personal concierge services at the Royal Beach Club. For more information: www.reservaconchal.com, 855.851.5000.